The stock market spent virtually the whole week giving the impression of levitating in thin air that increasingly convinced many with each passing day that the market would resolve to the downside. Instead the market surprised virtually all by doing what market trends tend to do most often which is to resolve in the direction of the primary trend, which for a bull market is UP. My long standing view remains that the stock market rally will continue into the end of the year when I expected the Dow to be trading north of 18,000. Which given that the Dow is now less than 200 points away looks likely to happen a lot sooner than even I had imagined, and something I will soon come back to in greater depth. In terms of immediate price action, the market needs to correct as I highlighted last week that a normal correction would see the market revisit the breakout point of at least 17,400. 16 Nov 2014 - Stocks Bull Market Grinds Bears into Dust, Is Santa Rally Sustainable? Once more all of the bearish scenarios reinforced by a week of bad fundamental news proved WORTHLESS, from Europe teetering on the brink of recession to Japan plunging into economic depression to US snowmageddon, all proved worthless noise because as I have often written that usually we won't actually know what the actual fundamental drivers are until long AFTER the price has moved! Which is why economists tend to be blind as bats when it comes to economic forecasting let alone attempting to extrapolate ivory tower economic theories on to market price movements and so why most of the time they can instead be found looking in the rear view mirror to explain what has already happened with the benefit of hindsight as if the exercise is of any importance. Despite this, despite decades of evidence, STILL clueless journalists base virtually their entire programming and commentary on what amounts to perpetual worthless economic conclusions that are usually even incapable of explaining what has already happened in HINDESIGHT never mind at attempting to arrive at what could be the most probable outcome. So if fundamentals are usually worthless than where do we look? Well my answer has remained consistent in hundreds of articles and several ebook's that price is where we will find the foot prints of market manipulations as the dark pools of capital accumulate and distribute into and from weak hands whilst all of the time consuming the productive capacity of an economy as they are aided and abetted by the central banks that INFLATE exponentially whilst having a whole stream of paid vested interests perpetually pumping out propaganda of the ever present threat of deflation that never actually materialises. To be clear when you hear someone warning of imminent deflation know this that you are either listening to a FOOL or a vested interest in perpetuating the deflation myth for the reality has always been of exponential inflation as a consequence of rampant money printing which is why most people, at least 90% of the general population are WAGE SLAVES to the elite who as a consequence of INFLATION own most of the productive capacity of an economy and why ordinary people no matter how hard they work and despite increased productively as a consequence of technological advancements still are getting poorer in real terms as at least 50% of the nations wealth produced is being siphoned off in the interests of the elite. 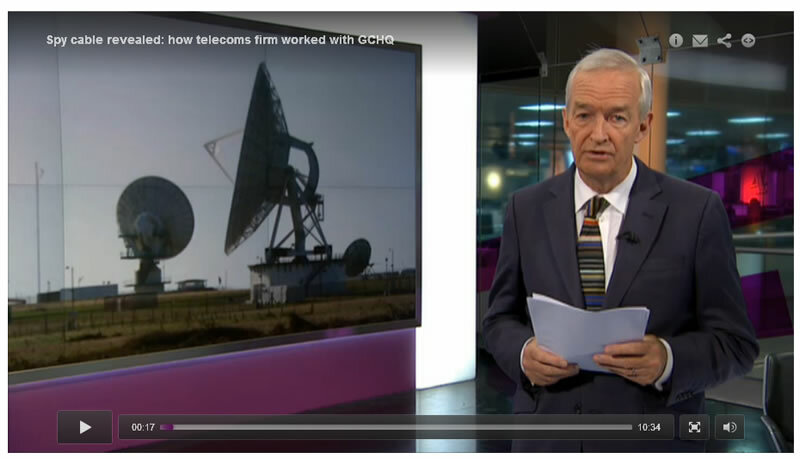 This week we saw an arm of Britain's secret police state stationed at GCHQ once more exposed in its quest for total control of ALL internet communications as GCHQ in partnership with internet firms such as Cable and Wireless (owned by Vodafone) hacked into internet backbones to copy everything. 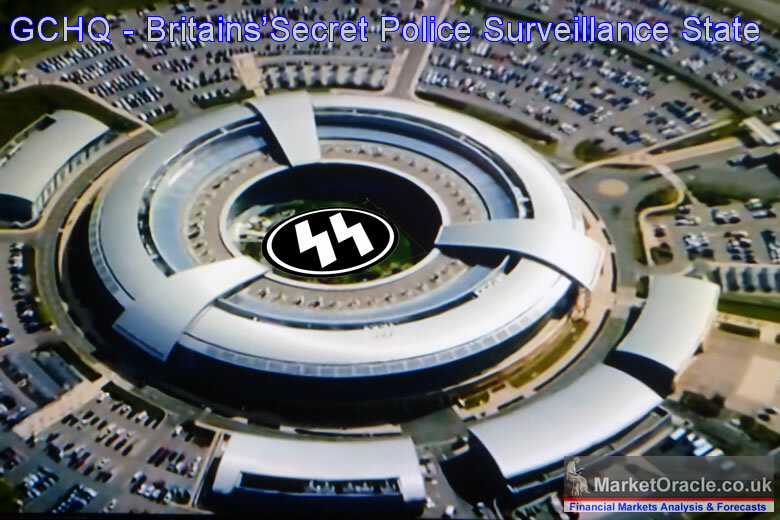 In response to which Britain's gestapo put up a smoke screen of propaganda to divert attention away from their agenda by alluding to threats such as ISIS for reasons why it is in the public interest to conduct TOTAL SURVEILLANCE OF the British people. For instance Abu Bakr al-Baghdadi, the head of ISIS is a former resident of Guantanamo Bay where I am sure he went through the CIA's white room programming programme that pressed the buttons that would turn a clueless Islamic fundamentalist into an effective leader of a Jihadist movement, an enemy created for a hidden agenda that the mainstream media continues to magnify the threat of for propaganda purposes. What is the hidden agenda for the creation of ISIS ? What is the end game ? Over throw of Assad ? Probably. Creating a pretext for the Israeli Military Empire to invade and further steal another nations territory (Syria) all on the basis of religious myths, even more probable. Remember you heard it here first! Anyway the real threat is NOT ISIS, it's not even Russia's Putler, for given two facts that firstly Russia is a basket case that economically just cannot compete that given the plunge in oil prices cannot even afford a border war let alone invasion and occupation of Eastern Europe, and secondly Putlers age means that he will soon be gone from the scene and the West will be able to once more press the reset button and the European situation 'should' then calm down for the truth since the end of the cold war is that there has been no ideological difference between east and west instead the current conflict is mostly in Putlers paranoid head which has not been helped by NATO's retarded expansion eastwards. So NO, Not Russia, the REAL THREAT is CHINA! 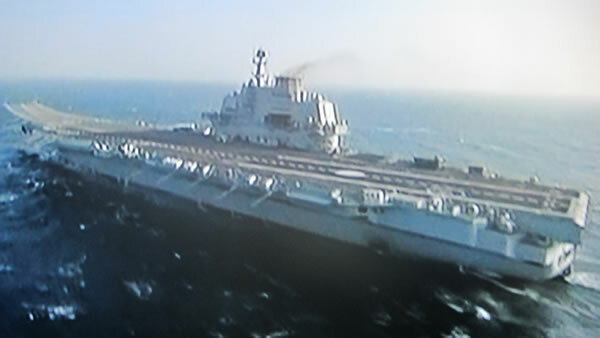 Today we only hear occasional murmurs of the Chinese threat, but it won't be long before we start to feel the full consequences of China's conversion from an economic superpower into a military superpower that will be a GLOBAL THREAT with literally a fleet of air craft carriers nearing completion. That is the REAL threat that the west faces and will likely result in what is unthinkable today such as a U.S. / Vietnam military pact which I see as INEVITABLE. In the not too distant future Vietnamese and U.S. forces will be conducting JOINT military exercises in an attempt to contain the Chinese Dragon. However, I fear that the clowns in the Pentagon are more concerned with creating propaganda such as ISIS and so I fear that it is highly probable that there will come a day when the United States will wake up to another Pearl Harbour! But this time it may all be over on that first day given that war gaming would conclude that any reaction would soon escalate into nuclear conflict and therefore China could succeed in permanently expelling the U.S. from Asia in just one day!